3M Stock Downgraded to Sell: Should You Worry? Goldman Sachs downgrades 3M stock to sell. Here's what you should know. 3M (NYSE:MMM) is up about 14% so far this year, but Goldman Sachs believes the stock's good days might be over. The Wall Street analyst giant recently downgraded 3M from neutral to sell, and assigned a price target of $159, representing roughly 8% downside from the current price. You don't see outright sell recommendations from top analyst firms every day. So what's the deal with 3M, and should investors in the company be worried? 3M's fundamentals remain strong. It's the company's "non-industrials" side that has made Goldman Sachs pessimistic. As reported on StreetInsider.com, analyst Joe Ritchie cited "pivoting from 'non-industrial' industrials" as his primary reason behind downgrading 3M. I don't blame you if you're confused, but allow me to explain. One of the biggest highlights of 2016 has been renewed investor interest in cyclical industrial stocks after a long lull. A perfect example is pure industrial play Caterpillar (NYSE:CAT). The heavyweight manufacturer's stock lost almost 28% of its value in 2015 as deteriorating conditions in the mining and oil and gas industries hit its top and bottom lines. The scene has been dramatically different this year, with Caterpillar clocking 40% gains so far. End-market conditions might not have improved yet, but the market appears to believe the worst is over for Caterpillar. 3M's gain of 14% this year pales in comparison to Caterpillar's run-up. Image source: 3M Investor Day Presentation, March 2016. Goldman Sachs believes cyclical stocks should continue to outperform defensive industrials in the near future as "industrial demand appears to be stabilizing and oil becomes less of a headwind," which is why 3M isn't as attractive anymore. In fact, Goldman Sachs also downgraded 3M's competitor Illinois Tool Works' stock rating to neutral for the same reason. Both companies compete in several common industrial markets; as in 3M's case, a big chunk of Illinois Tool Works' sales comes from consumer-centric markets. So should you sell 3M stock too? Elaborating on his 3M downgrade, Ritchie mentioned that "growth challenges" in 3M's electronics business, in particular, pose a headwind as "smartphone sales taper and the shift to OLED [displays] continues." Among its other products, 3M specializes in LCD display films for gadgets like phones and laptops. A 3M multi-touch interactive display. Image Source: 3M. Goldman Sachs' apprehensions perhaps stem from 3M's latest numbers. Electronics and energy was 3M's weakest segment during the first nine months of the year, with sales tumbling 10% year over year. With the exception of industrials, where sales were flat, all other 3M segments reported higher sales during the period. There's no denying that 3M's electronics and energy segment sales are under pressure, but the situation isn't as bad when it comes to margins. In Q3, the segment operating margin contracted by only about 40 basis points year over year despite a 7.5% drop in sales. In fact, 3M's overall operating margin for the nine months ended Sept. 30, 2016, improved 70 basis points, to 24.4%, on marginally lower sales. 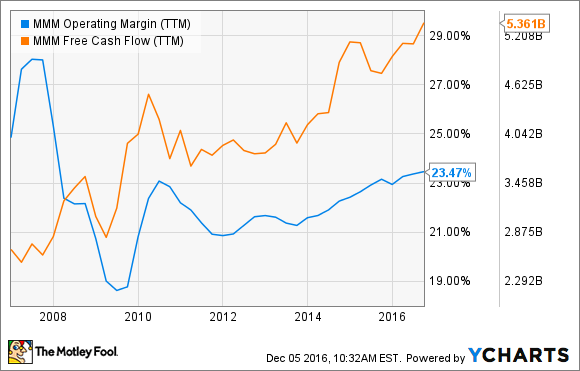 More important, 3M has consistently maintained margins above 20% and doubled its free cash flow in the past decade, regardless of the phase of the business cycle. MMM Operating Margin (TTM) data by YCharts. This reflects management's efficiency in handling a diverse portfolio in the best possible way to grow the company even in adverse conditions. So even if electronics sales taper in the near future, investors needn't panic yet. Healthcare -- 3M's highest-margin segment -- remains strong; its industrials and safety and graphics businesses could even benefit if infrastructure spending in the U.S. picks up. All this could help offset some of the weakness in electronics sales, if it persists. A revival in cyclical stocks won't diminish 3M's worth, or its ability to ride out storms. The company has proved its resilience, having rewarded shareholders consistently by increasing its dividend for 58 straight years. Going forward, 3M is targeting 8% to 11% growth in earnings per share and 100% free cash flow conversion through 2020. That should be good enough to discourage you from selling the stock.